“METROPOLITAN POLICE” Attention! Illegal activity was revealed! 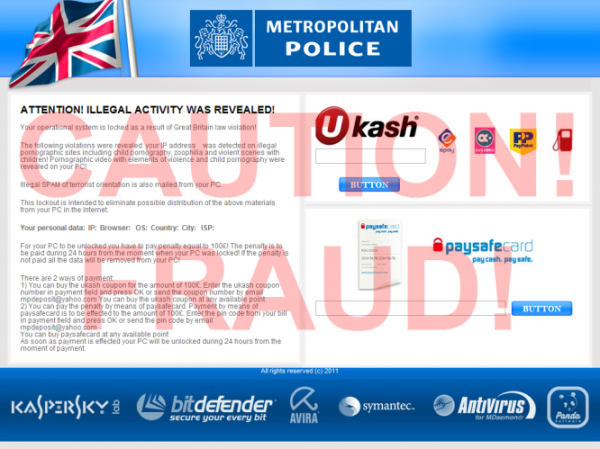 is the fake virus warning which has nothing to do with the Metropolitan Police of Great Britain. This is just the next fraudulent way developed by cyber hackers in order to collect money from users whose PC security has been greatly compromised or weakened. Nominating it with the right definition of various sorts of malware programs, this is nothing but the ransomware-type threat which requires of you to immediately effect the payment in order to restore control over your infected workstation. Another variant of such ransomware application was noticed previously, being known to substitute the Windows desktop with a bogus warning supposedly originated by the German Federal Police (BUNDESPOLIZEI). Obviously, cyber criminals change their virus application to suit various countries where they want to get as many victims as they can. So, this time they chose Great Britain as the platform for spreading their malware and reaching their evil plots. If your system is contaminated with this type of threat, you will encounter the difference immediately. Your desktop will be substituted permanently with the scareware warning titled as METROPOLITAN POLICE. It will prevent you from using or even having access to your files, programs and system applications. In fact, you will not be able to use your PC as you normally do. Even if you reboot your computer into Safe Mode or Safe Mode with Networking you’ll get the same problem. The virus states that you were noticed while watching illegal pornographic web-pages and claims that if you don’t pay £75 within 24 hours then your PC will be wiped clean, with all your important files and settings being erased. However, don’t ever get nervous, the virus is not capable of performing what it claims to be able to do. On the other hand, none of us would really want to stand any chance of losing important files or other valuable information, so there is a great probability that some person might actually become the victim of these frauds who developed the Metropolitan Police threat program. In order to get rid of the METROPOLITAN POLICE virus from your system please be so kind to follow the removal milestones in the uninstall section provided below. Of course, please do not hesitate to contact us at any time should your require our assistance on these or other matters. READ Lengthenlonwfvub.xyz fake Java Update alert removal. Go to your friend, relative or anybody else who has computer with Internet connection. Take your USB flash drive / Memory Stick with you. Download GridinSoft Trojan Killer installation file from this site https://trojan-killer.net/download.php and save it to your USB flash drive / Memory Stick. Get back to your infected PC and insert the USB Drive / Memory Stick into the respective USB slot. Perform hard reset (press reset button on your computer) if your infected PC has been on with Metropolitan Police background. If not, then simply turn your PC on. Before the very boot process begins keep repeatedly hitting “F8” button on your keyboard. In the window that appeared select “Safe mode with command prompt” option and press Enter. Choose your operating system and user account which was infected with Metropolitan Police virus. In the cmd.exe window type “explorer” and press “Enter” button on your keyboard. Select “My Computer” and choose your USB flash drive / Memory Stick. When the hijackers are successfully disabled (fixed) by GridinSoft Trojan Killer you may close GridinSoft Trojan Killer application. In the cmd.exe window type “shutdown /r /t 0” and press “Enter” button on your keyboard. Upon system reboot your PC will be unlocked and you will be able to use it just as before the infection took pace. However, it is recommended that you now update GridinSoft Trojan Killer and run the scan with it again to remove the source of the infections causing Metropolitan Police virus to infect your PC. 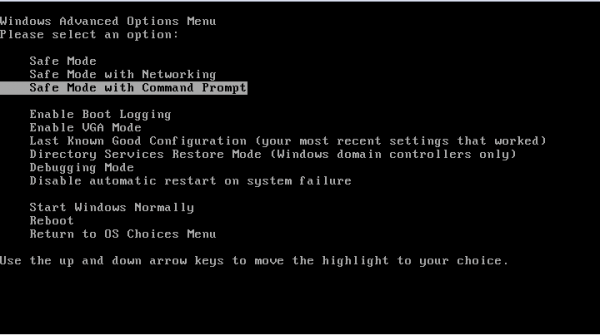 Restart your system into “Safe Mode with Command Prompt”. While the PC is booting press the “F8 key” continuously, which should present the “Windows Advanced Options Menu” as presented in the image below. Apply the arrow keys in order to move to “Safe Mode with Command Prompt” and hit Enter key of your keyboard. Login as the same user you were previously logged in under the normal Windows mode. 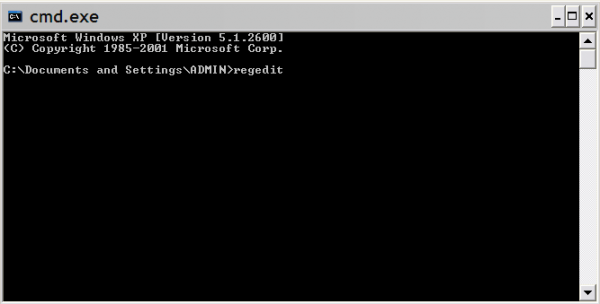 Once Windows boots successfully, the Windows command prompt would appear as described at the screenshot below. At the command prompt, type-in the word “explorer”, and press Enter. Windows Explorer should open. Please do not yet close it. You can minimize it for a while. 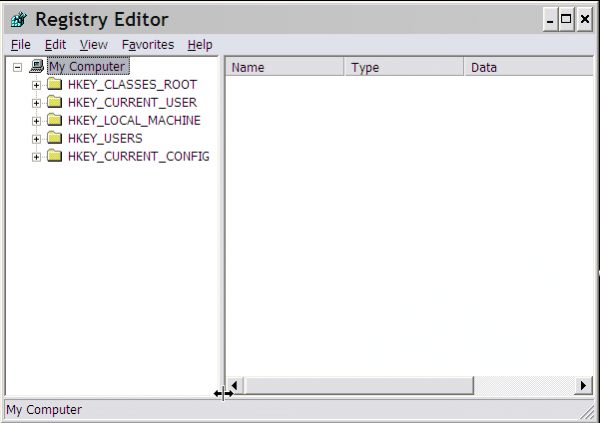 Afterwards open the Registry editor by applying the same Windows command prompt. Type-in the word “regedit” and hit Enter button of your keyboard. The Registry Editor should open. In the right-side panel select the registry entry named Shell. Right click on this registry key and select “Modify” option. Its default value should be “Explorer.exe”. However, Metropolitan Police virus did its job, and so after you click “Modify” you would see totally different value of this registry entry. Copy the location of the modified value of the above-mentioned registry entry to the piece of paper or memorize its location. It shows where exactly the main executable of Metropolitan Police virus is located. 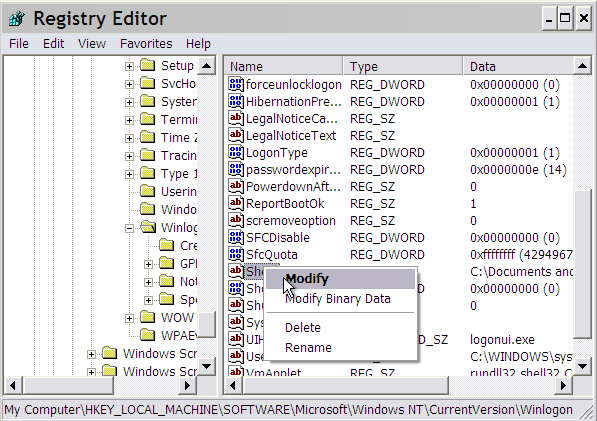 Modify the value of the registry entry back to “explorer.exe” and save the settings of the Registry Editor. Go to the location indicated in the value of modified registry entry. Remove the malicous file. Use the file location you copied into the piece of paper or otherwise noted in step in previous step. In our case, “Metropolitan Police” virus file was located and running from the Desktop. There was a file called “contacts.exe”, but it may have different (random) name. Get back to “Normal Mode”. In order to reboot your PC, when at the command prompt, type-in the following phrase “shutdown /r /t 0” (without the quotation marks) and hit Enter button. The virus should be gone. However, in order to clean your PC from other possible virus threats and malware remnants, make sure to download and run GridinSoft Trojan Killer downloadable through the button below.